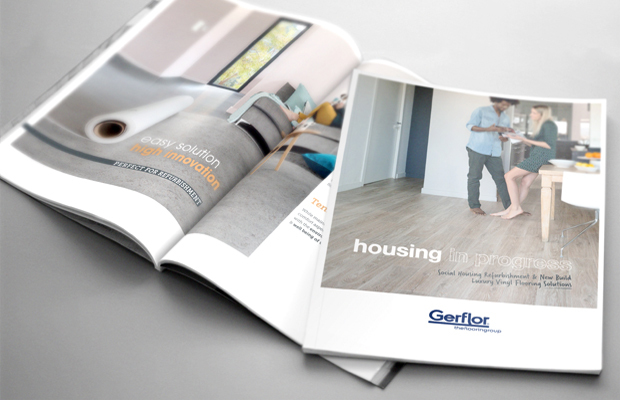 Branded ‘Housing in Progress’, Gerflor’s new social housing refurbishment and new build luxury vinyl flooring solutions brochure is a must-have for those wanting the latest flooring product information for social housing projects. Having 35 pages crammed with fresh flooring solutions for internal areas of the house building process including communal, functional and living spaces, the handy guide covers dedicated, high performance products to cater for the aesthetic, technical, economic and environmental needs of housing professionals. As the global vinyl flooring manufacturer provides ideal products for every aspect of flooring in housing, Gerflor is a convenient single source supplier of both residential and commercial products, which include the most comprehensive collection of floorings meeting HSE guidelines. These advanced, vinyl floorings have unique specifications, embrace decorative trends, appeal to tenants and come in a great choice of designs with extra thermal, comfort, acoustic and performance benefits. For example, Gerflor Fibre Technology (GFT) ≥36/R10 slip resistant residential floorings with a unique waterproof balancing interlayer have been developed to fast track installation. Ideal for refurbishment, they can be loose laid over most smooth, flat, hard, clean existing surfaces, even where moisture levels are high, saving both time and money and allowing contractors to lay up to twice as much m2 per day. Available in multiple widths, further reducing waste and inconvenience, they also have inclusive, innovative technology that dramatically reduces remedial work. Gerflor’s unique, problem solving flooring innovations are high quality products combining top design with technical advantages like patented surface treatments that allow then to look good for longer with simple, low-cost maintenance. Together with accessories, skirtings, tools, wall protection, SPM handrails and entrance matting, Gerflor has a broad spectrum of housing needs covered. Tarasafe™ Ultra H2O – for barefoot and shod wet areas where slip resistance, hygiene and durability are necessary. Griptex – a GFT backed flooring combining cushioned comfort with slip resistance for kitchens, bathrooms and living spaces. Agrippa – a 19db acoustic residential vinyl in popular designs and colours. Taralay Impression Control – decoration meets high performance in a flooring for heavy traffic and communal areas. Tarasafe™ Standard & Ultra – containing glass fibre grid technology and a SparClean® finish for performance in corridors, entrance halls and stairwells. Gerflor has a UK base, dedicated housing team, stock holding warehouse and national distribution network. Floorings are manufactured to Gerflor’s environmentally-sustainable, life-cycle analysis policy at ISO 14001 certified production sites using sustainable, responsible raw materials and recycled content. They meet the highest international standards and have the lowest VOC emissions, contributing to good indoor air quality and well being. or email contractuk@gerflor.com / call 01926 622600.